The Godinez Gonzalez sisters, Karla and Ana, dominated on the mats and at the awards banquet on Saturday as the Canada West wrestling championships wrapped up in Edmonton. The UFV Cascades’ siblings from Surrey, B.C. each won a Canada West award in addition to individual gold medals at the conference tournament. Cascades sophomore Karla Godinez Gonzalez was named Canada West’s outstanding female wrestler, winning all four of her matches in the 55 kg weight class without surrendering a single point. She’s the first UFV wrestler, male or female, to win a most outstanding wrestler award at the conference level. Younger sister Ana was voted the Canada West female rookie of the year – an award Karla won last season. She laid waste to the competition at 63 kg, allowing just one point against while winning three of her four matches via technical superiority. “The amount of time they put into wrestling is incredible – they’re students of the sport, and they did what they’re capable of this week,” Cascades head coach Raj Virdi enthused. “They’re so dominant in every position on the mat, and when they need to score, they score. Brad Hildenbrandt added a third gold medal for the UFV wrestling program, defending his title in the heavyweight (120 kg) division. The Surrey, B.C. product’s only close call came in his opening match on Friday, when he had to come from behind to edge Jordan Tholl of the Regina Cougars 6-4. Both wrestlers are ranked nationally in their weight class – Hildenbrandt No. 1, Tholl No. 3. From there, it was smooth sailing for Hildenbrandt, who won a U SPORTS title and was named UFV’s male athlete of the year in 2017. He won each of his last three matches by technical superiority. In other action on the men’s side, four Cascades rookies climbed the podium. Parker McBride (54 kg), Jacob Torres (61 kg) and De’Andre Williams (76 kg) battled their way to silver medals, and Karan Dhillon (72 kg) added a bronze. The Cascades’ seven individual medalists qualify for the U SPORTS championships, Feb. 23-24 in Sault Ste. Marie, Ont. That’s a record for the UFV program, which sent four to nationals in 2017. 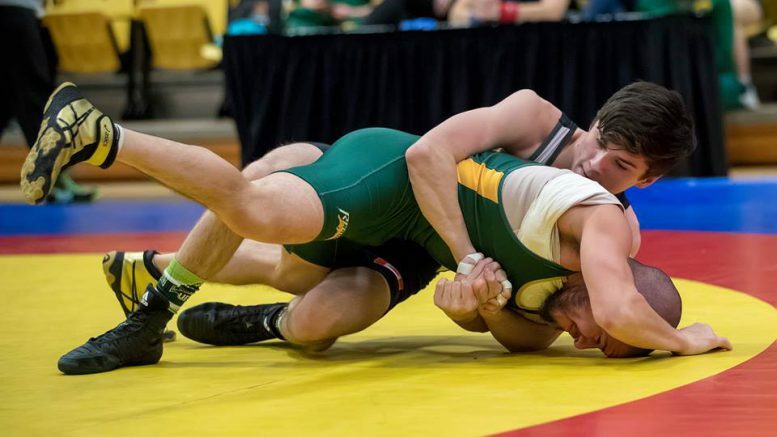 Four other grapplers competed on behalf of the Cascades in Edmonton. Brittany Chiu was fourth in the women’s 59 kg division, Glaysia Sparling was fifth in the women’s 82 kg, Haseeb Javed was fifth in the men’s 68 kg, and Kamil Golowko was fifth in the men’s 100 kg. The Cascades finished fifth in both the men’s and women’s team standings. The host Alberta Golden Bears and Pandas swept the team titles. The University of the Fraser Valley women’s volleyball team returned to form offensively to claim a weekend split on the road against the College of the Rockies Avalanche on Saturday. The CCAA No. 7-ranked Cascades, coming off a four-set defeat on Friday in Cranbrook, got a much more efficient offensive performance in the rematch, winning by scores of 25-21, 25-15 and 25-23. They boosted their record to 13-9, tied for third in the PACWEST with the Capilano Blues, while sixth-place COTR fell to 7-17. Gilray lauded the play of rookie setter Olivia Heinen, who had the Cascades firing on all cylinders. She set the table for left sides Kim Bauder (15 kills) and Amanda Matsui (11 kills) to rack up double-figure kills. Middle Hanna Hieltjes also had a strong showing with nine kills, and was voted player of the game by her teammates. “Our transition offence was able to be successful because we put pressure on them in serve-receive, and we did a really good job of connecting offensively today,” Gilray said. The Cascades volleyball teams return to Abbotsford for a home-and-home set with their crosstown rivals, the Columbia Bible College Bearcats. The series opens Friday at UFV’s Envision Financial Athletic Centre (women 6 p.m., men 8 p.m.), and the scene shifts to Columbia Place Saturday (women 5 p.m., men 7 p.m.). 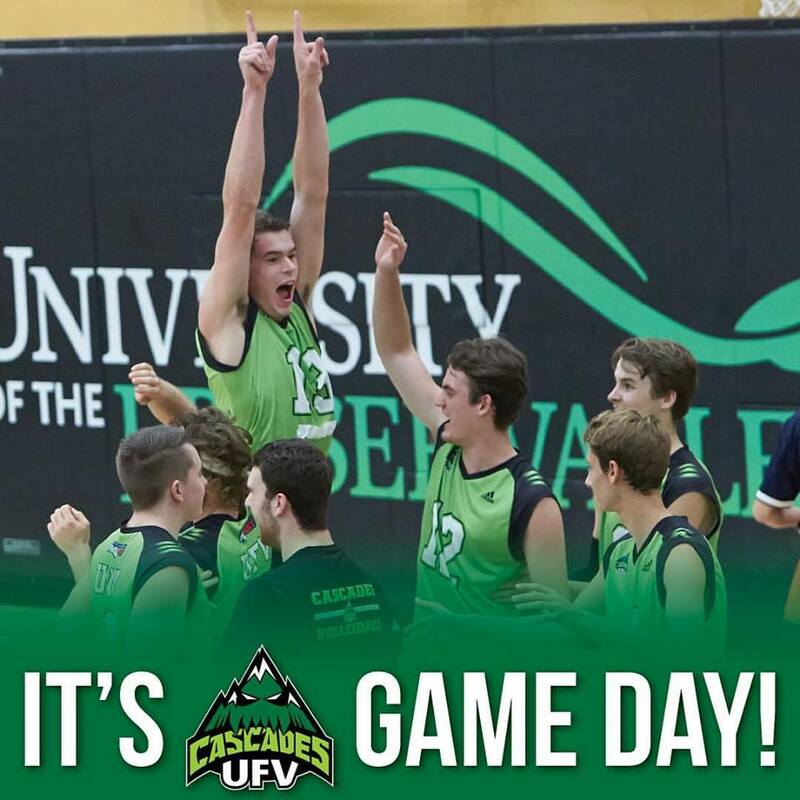 The University of the Fraser Valley men’s volleyball team’s six-game losing streak is a thing of the past, thanks to a three-set triumph over the College of the Rockies Avalanche on Saturday in Cranbrook. The Cascades had suffered a deflating five-set loss on Friday vs. COTR, dropping the last two sets. They turned in a focused performance in the rematch, finishing each set strong (26-24, 25-22, 25-23). UFV improved to 10-12, which leaves them fifth in PACWEST but just two games back of the third-place Camosun Chargers (12-10) with the Douglas Royals (11-11) in between. The sixth-place Avalanche wrapped up the regular season with a 5-19 record, and now wait to see how the Cascades fare next weekend in their own regular-season finales against the Columbia Bible College Bearcats. The Bearcats are 4-18, and are chasing the Avalanche for the conference’s sixth and final playoff berth. The Cascades got a boost when kills leader Nick Bruce returned to the lineup after being sidelined due to injury Friday. Ben Friesen paced the UFV attack with 13 kills, and Donen was pleased with the play of a trio of Cascades youngsters who played more extensive roles than usual. Ian Jagersma, a 6’10” rookie middle, made his first career start and registered five kills and three blocks. First-year setter Brendan Loewen and sophomore right side Graeme Hughes also stepped in and sparked the Cascades. The Cascades volleyball teams return to Abbotsford for a home-and-home set with their crosstown rivals, the Bearcats. The series opens Friday at UFV’s Envision Financial Athletic Centre (women 6 p.m., men 8 p.m.), and the scene shifts to Columbia Place on Saturday (women 5 p.m., men 7 p.m.). 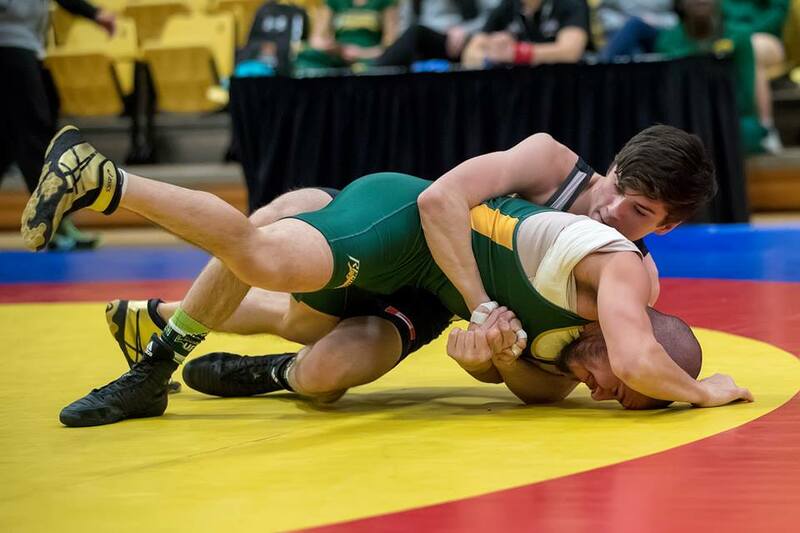 Be the first to comment on "UFV Sports Saturday – Wrestling Gold, Good Day For Volleyball"